Oilfield jobs have attracted workers from all across Canada. Searching, finding and applying for the best jobs for you will take some research and dedication, you will find helpful job hunting tips in this post. Learning how to write your oil and gas resume or reaching out to a resume writer with experience writing in the oil and gas industry will save you an abundance of time and frustration. Learning how to write your oil and gas resume or reaching out to a resume writer, like myself, with 16 years of experience writing in the oil and gas industry will save you an abundance of time and frustration. Once you have your keyword-rich, accomplishment-based online friendly resume or CV targeted to the oil and gas jobs you wish to secure you are ready to apply. The greatest concentration of onshore oilfield work is currently in Alberta, but can also be found in pockets of British Columbia, Saskatchewan, Manitoba, the Northwest Territories, the Yukon, and Quebec. If working the offshore oil rigs is of interest to you, you may wish to look at the East Coast, as well as the Arctic shoreline. Based on the news in the energy, oil and gas industry, Grande Prairie, AB, and many other areas should see an increase in exploration, development, and production. Many oilfield workers have waited for an upward swing after a long downward slump. Time will tell what direction the oil and gas industry takes as we are going into that quarter of 2017 – predictions are strong for the first quarter of 2018. Since Alberta has the most abundant wealth of oil, particularly the Athabasca Oil Sands (also known as the Athabasca Tar Sands), this is a good place to start your job search. Regardless of whether you are entering an oil field job for the first time, or have years of oil rig experience, northern Alberta is a great place to target your resumes. Grande Prairie, AB has been known as one of the top cities for hiring oil field workers of all levels, from operators, consultants to truck drivers to dispatchers. If interested, you can take the time to read a news article via newswire.ca which discusses why the Canadian economy’s streak continues in 2017. Syncrude Canada Ltd.– Syncrude is one of the largest producers of crude oil from Canada’s oil sands. They operate a large oil sand mine, utility plant, bitumen extraction plant and upgrading facility that processes bitumen and produces value-added light, sweet crude oil for domestic consumption and export. Nabors Industries Ltd.– A contract-based drilling company focusing on land drilling, workovers, and well-servicing rigs, as well as oilfield hauling, engineering, civil construction, logistics, facilities maintenance, and project management. Savannah Energy Services Corp– An energy business that concentrates on coil tubing, vertical drilling, horizontal drilling, and overall well servicing. Weatherford– An oilfield service company that focuses on all aspects of the life cycle of a well: drilling, evaluation, completion, production, and intervention. Related: Have you considered changing careers out of the oil and gas sector? For more information try the Canadian Oilfield Service and Supply Directory (COSSD) – it is Canada’s most comprehensive oil patch directory with a specific focus on service and supply companies operating in Canada’s Western Canadian Sedimentary Basin. The COSSD is the most widely used industry-accepted directory, with more than 26,000 listings in over 1,900 specialized oilfield categories. This resource has an unmatched track record in targeted distribution and market penetration and makes the COSSD the definitive guide to Canada’s oil and gas industry. Note: the above is not an exhaustive list, as there are many, many more companies that you may wish to research and apply with. Once you have been hired by a company, and have established a good reputation with your Tool Pusher/Rig Manager, it is easy to request a transfer to open positions at different rigs or locations. Though more often than not, when an oilfield worker finds a rig and crew that they enjoy, they are far more likely to stay with it. Once you have reached the level of Consultant, you may wish to work in an office in one of the bigger centers, or you may choose to work onsite and travel from rig to rig. Regardless of the oil field job classification, you wish to end up with, remember that you must be committed to hard work, teamwork, a healthy and active lifestyle, and continuing education. Each type of operation has its own unique qualities and speed. You may want to test out which rig or platform suits you best, particularly as you advance to the level of assistant driller or driller. An oil field job is a great place to work if you like long hours, a fast pace, and large paychecks. If you have never worked in this sector or if you are looking for an upgrade to a better position, a solid resume and cover letter are essential for making the transition. If you are brand new to the industry, or fairly junior in the ranks, there are a few qualifications you must possess or pursue. As you climb the ranks, bear in mind that sedentary positions can lead to health problems. Stay fit in your downtime by developing a solid workout routine and adding different exercises or sports as the seasons change. For instance, if you are an avid cyclist, consider bringing a recreational bicycle or mountain bike to your location. In the winter, you can snowshoe or cross-country ski. Many oil field camps also provide small gyms, basketball courts, or workout spaces for their employees. If you aren’t staying in camp, consider a membership at the local gym, or find a franchise that is popular throughout the region, allowing you to attend the gym, regardless of location. Now you’re wondering, “How does this help me get a job?” Maintaining a fit and healthy lifestyle is important to hiring managers. They want to know their employees are able to pass a drug test, perform excruciating physical tasks in all types of weather, and are committed to staying fit. Include these items in your cover letter. You don’t need to dwell on the topic, but add a line or two at the end of your cover letter, demonstrating your physical abilities and willingness to work long hours in fluctuating climates. Need a hand with developing your career changing resume and cover letter? Canadian Resume Writing Service can make your documents stand out… Guaranteed! 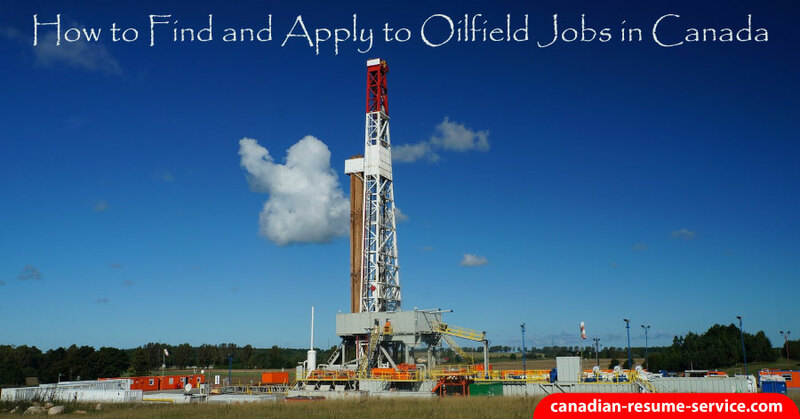 In addition, if you are unsure if this is the right industry for you, or you would like to learn more about how to conduct an effective oil field job search, don’t hesitate to contact Candace, the owner of the Canadian Resume Writing Service today via toll-free: 1 877 738 8052 or email candoco@telus.net. Candace is able to provide you with proven job search methods, effective job interview techniques, and strategies for maintaining a successful and upwardly mobile career. Packages and pricing information are available for your review.